On “Please Like Me” (a co-production between Pivot and Australia’s ABC), comfort doesn’t come cheap. Centered around Josh’s friends and family, it’s a show that can be phenomenally withholding, relishing in the silence of unmet expectations. But the central relationships on the show are far from irony-laden, shallow or mean. This isn’t the purposeful contempt of “Curb Your Enthusiasm” or the coded cruelty of “Girls.” There’s no wondering why, or if, these people like each other. Quite to the contrary, the emotional restraint, peevish dickishness, and — crucially — the denied indulgence on “Please Like Me” all express kinship so simpatico that it is a hushed miracle. “Please Like Me’s” empathy, defined by unassuming affection, defies the binary of feeling frequented by TV comedies. We’ve seen sharper so-called friendships before, but they scarcely belie such an compassionate core. If a gooey center is hidden by a hard shell, that’s usually part of the conceit — a cold shoulder that needs warming or a defensive mechanism that needs bulldozing — but rarely has it been seen as an authentic mode for intimacy and connection. On “Please Like Me,” friendships transform the shorthand of shared experiences into a full-fledged distinct language. It’s an inside joke as a worldview. It turns out that Claire is asking Josh to “indulge” her because she is pregnant and needs Josh to accompany her to an abortion clinic. The abortion, depicted in the following episode, leaves both Claire and Josh unexpectedly unsettled, and so Josh proposes sharing his “irrational feelings…in like a monotone voice, and you can do the same, and what we’ll do is we just won’t judge each other’s feelings.” Josh’s prescription defines bone-deep connection on “Please Like Me” — it’s so quietly empathetic, it’s damn near telepathic. It’s not that emotion on “Please Like Me” is persistently blunted (something to which Josh’s perpetual eagerness to mock bestie Tom, played by Thomas Ward, can attest). But the more cutting the emotional truths delivered, the closer to a whisper they come. It’s a denial of performed catharsis in favor of unvarnished, mumbled understanding. If “Please Like Me” is the introvert huddled in the corner at a party, “Master of None” is the extrovert on the dance floor. Aziz Ansari’s Netflix comedy (co-created by Alan Yang) is also a show about relationships that make sense, but the show features a relational language that is primarily declarative. Instead of “Please Like Me”‘s complacent harmony, “Master of None” is so drunk on good vibes that it probably has the phrase tattooed on its forehead, immortalized in an Instagram handle. On “Master of None,” friends bond — over music, over pasta, over specific sexual experiences. And, more to the point, they freaking love bonding. There’s a quick moment in “Plan B,” the series’ debut episode, in which Ansari’s Dev invites his skeptical friend Arnold (Eric Wareheim) to a kid’s birthday party. Knowing the selling point for his bud, Dev’s whole body primes itself for the moment of shared zeal. His eyebrows bounce, his eyes become saucer-like Magic 8-Balls, he leans forwards, and, in unison with Arnold, he sing-whispers, “Bounce house.” While Ansari’s bodily fervor was deployed for the sake of narcissistic spasms during his years on “Parks and Recreation,” on “Master of None,” it’s an olive branch, an invitation to mutual joy. And so relationships on “Master of None” become about intoxicating compatibility, a compatibility that is quantified as much by tangible likes as it is by emotional or spiritual communion. As the series progresses, Dev acts like a kind of cultural journalist. Be it his parents, his co-stars, or his girlfriend’s grandmother, Dev wants to know them, to mine their history, to collect their stories. It’s a worldview informed by “Master of None’s” specific saturation in modernity, as Dev lives in a social world of Instagraming brunch, watching “Sherlock” and Yelping tacos, where documenting and sharing your tastes is an essential subset of having them. On “Please Like Me,” timely culture is deliberately relegated to the show’s fuzzy backgrounds, so that people bond over ephemeral observations instead. “Master of None,” conversely, makes culture bind relationships, from Dev’s dad using his iPad as a physical and emotional bridge to his son through to the very bones of the show, such as when the “Halloween” score and “Don’t Worry, Be Happy” are juxtaposed in a cunning effect that the viewer is meant to get. And so empathy on “Master of None” grows out of curating moments and sharing them. “Ladies and Gentleman,” the series’ seventh episode, gets its juice when Dev asks his co-star Diana (Condola Rashad) about her weekend and learns that she was followed by a creep from the same bar Dev left in blissful ignorance. The revelation launches Dev’s stint as a feminist warrior, including an incident in which he makes a citizen’s arrest of a masturbating man. It’s fair to say that by the end of the episode, having bonded with women and heard some of their experiences, Dev is glad he asked Diana about her life. But as Dev repurposes his social act as a stellar anecdote, a kind of feminism membership card that gets him in good with women at a bar, it’s worth wondering what his interest in Diana’s weekend amounts to. Stories he can tell, definitely; something he will think about in similarly sexist situations, hopefully; but a lasting concern with either Diana’s personhood or societal misogyny? It hardly seems so. After all, while Dev is cozy with the women at the bar, the episode begins by asking, what happens when those women and Dev each leave, going their separate ways? None of which is to say that “Master of None’s” flashy empathy is inferior to “Please Like Me’s” less-is-more pathology. While Dev’s attempts to expand his life experiences are genuine, if incomplete, the flat affect on “Please Like Me” is inherently exclusionary. It’s awkwardness, aloofness, and deadpan deployed as defensive armor, preemptive strikes against people taking an interest. In the show’s most recent episode, “Puff Pastry Pizza,” Tom even builds a pinata filled with the secrets between himself, Josh and Claire, so mounting are the things unsaid. Sure, Josh, Tom, and Claire fundamentally understand each other, but if that understanding is necessarily implicit, it’s still an insular way to communicate. While “Master of None” sees an endless sea of possible human connection and goes for the hug, “Please Like Me” shrinks inward. When Josh’s mom (Debra Lawrence) asks why he puts up with Arnold (Keegan Joyce), his wishy-washy love interest, Josh explains, “When was the last time you met a new person and thought, ‘Oh gosh, that’s an interesting thing you just said? '” While Josh is stunted by how disconnected he feels from most people, Dev is crippled by opportunity, from taking so long to pick a taco place that he goes without to [SPOILER ALERT] losing his girlfriend Rachel (Noël Wells) after making her decide her certainty about their relationship as a percentage. In its black sheep complex, “Please Like Me” internalizes its empathy, privileging the people it already understands over those who it eventually might. It’s connection forged in invisible ink, restricted to people with specialized sight. 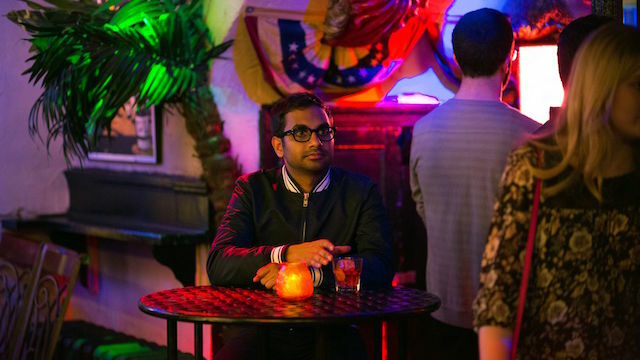 In “Master of None,” connection is all about the lowest common denominator. You wear your interests as transparently as possible, in the hopes of finding a match. While “Please Like Me” whisper-mumbles its title’s insecurity, “Master of None” shouts its voyeuristic interest so insistently, it nearly spits on your face. “Please Like Me” airs Fridays at 10pm on Pivot. “Master of None” Season 1 is streaming now on Netflix.